Princess Leia, translucent blue and flickering like a 30s TV set as she leaves Obi-Wan an SOS on her faithful R2 unit. Grotesque, garishly-coloured aliens beating each other up other during a Chewie vs R2D2 game of Dejarik chess ("Let the Wookie win"). We're all familiar with holograms Star Wars style. But, nearly 38 years on with a new Star Wars movie in production, it looks like we're close to bringing practical holographic technology to our galaxy. Star Wars' SFX holograms are actually one of the reasons that the movie hasn't dated as much as its contemporaries. Despite some technological advances, we have been, up until now, unable to accurately replicate them, ensuring that the tech in Star Wars looks advanced. Compare this with the technology in Alien, released two years later in 1979: the computer screen graphics are reminiscent of 1981, rather than 2119. Holograms have their roots in a 400-year-old conjuring trick that went mainstream during Victorian times, acquiring the moniker Pepper's Ghost after John Henry Pepper, who popularised the effect. Pepper's Ghost uses glass and lighting effects to create the illusion of objects appearing and disappearing. Contemporary Pepper's Ghost solutions have been around for a while now, but, like the Star Wars franchise, hologram technologies in general are currently undergoing a reboot, with technologists finding new ways to come close to replicating George Lucas' vision. Perhaps the best-known commercial Pepper's Ghost solution is Dreamoc. Introduced by RealFiction in 2009, it is mostly used for brand launches, as it is particularly effective when combined with 3D objects such as beer bottles and watches. This blurring of the lines between solid objects and 'smoke and mirrors' lends additional credibility to the overall effect, which, while effective, is undermined by its boxed-in design. The £60,000 Holo drew Star Wars comparisons when it launched in 2013, and although it's also a Pepper's Ghost-style offering, the impressive dimensions (2.4 metres in height) lends additional gravitas. It would have no problem replicating the "help me Obi-Wan Kenobi" sequence, albeit with Leia housed within a four-sided glass pyramid-style display. Designed by Conran Partners and launched by Beagle Media, Holo has been touted as the 'world's first 360° interactive hologram'. It generates gesture-controlled floating images, so you can control the holograms as well as observing them all the way around. It really does look the part and produces great holographic effects, but it's impossible to escape the fact that – as with Dreamoc – the holograms are encased within glass. But is there anything that comes close to the beaming-into-thin-air communication revolution of the Leia sequence, or the floating-in-thin-air magic of the Dejarik game? According to Ostendo Technologies, smartphones will soon allow us to speak to holograms of our friends and family in the palms. QPI (Quantum Photonic Imagers), 2D and 3D chips apparently project images into mid-air – although it is unclear what these images project onto, so we'll reserve judgement. Ostendo has already raised $90m from venture capitalists and has reportedly received $58m in US government research contracts, so there must be some substance to their plans. 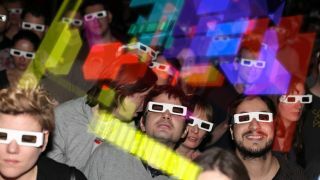 The subject of an intellectual property dispute and currently suspended from Kickstarter, Provision's HOLOVISION: A Life Size Hologram is claimed to generate 3D images via 'volumetric imaging', using an LCD screen and concave mirror to create the illusion of a floating 3D image. HOLOVISION's original Kickstarter campaign included a bunch of hugely aspirational images plus a video featuring Provision founder Curt Thornton that made seriously bold claims, accompanied by holographic sequences from Star Wars and other sci-fi movies. Given what we already know about in-box style hologram systems (which this surely is), this use of movie clips and still images perhaps creates expectations that any tech company would fail to live up to.